What would you do with the cash you could save on your fuel bill each month? Thanks to Shell #FuelRewards refer a friend program, I just paid 11 cents a gallon for 10 gallons of gas -HOLLA! 2. 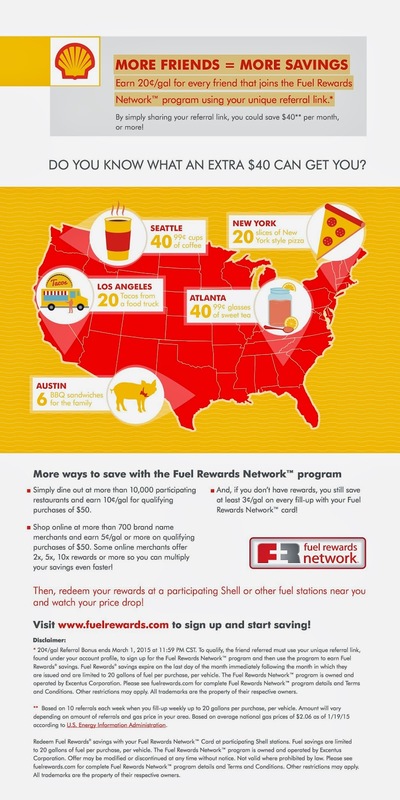 Refer friends to sign up for Shell Fuel Rewards via your unique referral link with the Refer-A-Friend promotion This is my favorite way to save. In November, I had so many rewards due to the Refer a Friend Program that I paid only 11 cents a gallon during two of my fill-ups - HOLLA!!! Below is an infographic that Shell produced to give you a few ideas on how your savings can add up using the Fuel Reward Network. With so many ways to save, it can be hard to keep track of how much you’re saving at the pump! Now you can check your rewards balance by texting ‘Balance’ to UFUEL (83835).